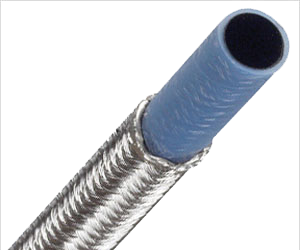 PTFE Flexible Hoses Manufacturer, PTFE Flexible Hoses Manufacturer in Pune. Polytetrafluoroethylene (PTFE) is an engineered fluoropolymer. Oustanding resistance to chemicals is one of its primary attributes. A broad temperature range of -100°F to 500°F (-73°C to 260°C) make this hose material suitable for the majority of fluid and ambient temperature conditions found in industry. An extremely low coefficient of friction, (0.05 to 0.20), provides a non-stick surface. Water absorption of PTFE is negligible, less than 0.01% by ASTM test, and it is FDA-approved for food and pharmaceutical use. Additionally PTFE will withstand flexing and vibration without failure from flex fatigue. PTFE is chemically inert, it will not break down or deteriorate in service and it has an unlimited shelf life because properties do not change with age or exposure to weather.